Touch dimmers – Govena Lighting S.A.
Govena dimmers enable seamless adjustment of illumination power. They are produced as OEM and Govena-branded modules for customers, as well as finished product, so-called “Metal Line”. operability in a two-way system with control modules PROS 1 (see user’s guide). 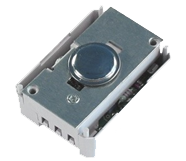 We can also make PROT and PROI dimmers with software which performs many additional functions, e.g.